The Baby Competition Is On! Maria was so excited! In just a few more weeks, the new baby would be here. She already had two brothers and two sisters, whom she loved dearly, but still she could hardly wait for the new arrival. She was singing happily as she helped her mother dust and put the finishing touches in the baby's room. Maria wanted everything to be just perfect. She had even gone to the store with her mother and bought a toy for the baby with her very own money. She propped the toy up on the dressing table so the baby could see it when he had to be changed. Everything was done, and the only thing left to do was to wait. The two weeks seemed like two years for Maria. Finally the baby was born and she was allowed to go to the hospital to see her mother and the new little one. She was overjoyed when the nurse told her she could hold the baby if she sat down and was very careful. Maria gently rocked the baby and watched as a tiny smile crept across the baby's little face. "Mom, he likes me," she whispered happily. It seemed like one of the best days of Maria's life. 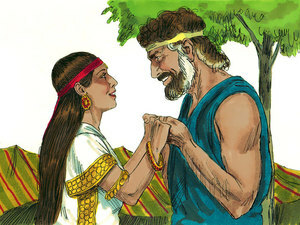 After Jacob was tricked into marrying Leah, Laban consented to allow Jacob to marry Rachel also. It was never God's plan for a man to have more than one wife, but all of this happened way before God gave Moses the commandments, telling them it was sinful. Having more than one wife was very common in the country where Jacob was living, and even though it wasn't God's choice for his people, God didn't punish them for it. Jacob, Leah, Leah's servant Zilpah, and Rachel and her servant Bilhah all lived together as one big family, although it wasn't a very happy one. There was a lot of anger and arguments. Jacob dearly loved Rachel and Leah knew it and became jealous of her sister. Days turned into weeks, and weeks turned into months, and Leah had her first baby. He was such a sweet, little baby boy. Leah named him Reuben. "Surely Jacob will love me now that I have given him such a wonderful little son," Leah thought, but it didn't quite work that way. 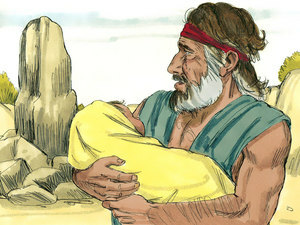 Jacob was happy about his little boy, but he still loved Rachel more than Leah. A second son was born to Leah. "God saw that I am unloved by my husband, so He gave me another little boy," she said. Leah named her second baby Simeon. Nearly a year had passed and not much had changed in this household. Jacob still loved Rachel more, and Leah was still sad and jealous, but she had her babies to look after and keep her busy. Soon she had a third baby boy. She named him Levi and said, "This time my husband will certainly love me, because I have given him three sons." But poor Leah . . . Jacob still loved Rachel more than he loved her. Time went by and Leah had a fourth child. She named this baby Judah, which means praise. When this child was born, Leah decided that it hadn't done her any good to be sad and jealous. "Things are as they are," she thought. "Jacob may still love Rachel more than me, but I am the one that has been blessed with four beautiful little boys. I am going to praise the Lord." We might think that Rachel would be the happiest woman on earth because her husband loved her so much, but that isn't the way it happened. When Rachel saw that her sister had four, bouncy baby boys, she became jealous of Leah and angry with Jacob. "There's nothing I can do about it," Jacob said defensively. "I can't help it that Leah is able to have children and you aren't. Can't you just be happy that I love you?" Rachel, with no children to look after, had a lot of time on her hands. She spent much of this time pouting because she didn't have any babies, but she also had time to come up with a scheme. Rachel took this chance to present her plan to Jacob. "You take Bilhah, my maid, for a wife. If she has children, I will care for them and they will be like my own." Now Jacob was willing to do just about anything to please Rachel, because he loved her so much and he wanted to stop all the anger and jealousy over children, so he agreed to Rachel's plan. Rachel was delighted when Bilhah had a son. She said God had finally heard her prayers. She named the baby Dan. Then Bilhah had another baby boy. Rachel was as thrilled over this second baby as she was over the first. She named him Naphtali and proclaimed that she was going to win the struggle with her sister, as if it was some kind of contest. 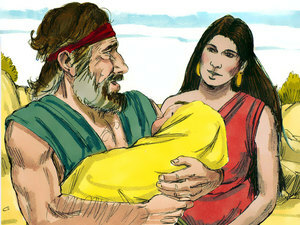 She treated both Dan and Naphtali as if they were her very own children. Leah had four children of very her own and Rachel had two children to call her own, but this isn't the end of the baby competition. Leah hadn't had any babies in a while, but she wasn't about to give up. She had a talk with Jacob. "You married Rachel's maid, and that's not fair! You have to marry my maid, too." So Jacob, hoping to put an end to this feud once and for all, married Zilpah. Yes, you guessed it! Zilpah had a baby boy. Leah said, "He's a real trooper" and called his name Gad. About a year later, Zilpah had another son. Leah was beaming with happiness because this made the sixth child she could claim as her own (although we know that only four were really hers). "All the other women will call me blessed!" she exclaimed, and she called his name Asher, which means happy. So now the score is Leah six, Rachel two . . . but Leah still isn't quite as happy as she thinks she could be. Leah's oldest son, Reuben, was out in the field and found plants called mandrakes. The plant was believed to be magic, and women believed the plant would help them have babies. Since all the women in this household were fighting over who could have the most babies, those mandrakes were a hot commodity. Rachel saw the mandrakes and wanted them. "Give me those mandrakes that your son found!" Rachel demanded. "No way!" Leah yelled back. "I'm not giving those to anybody!" "Please??" Rachel pleaded. "I'll make a deal with you. If you give me the mandrakes, I'll let you have some special time with Jacob." "Oh, all right," Leah conceded. "With all these chilren running around, it's been a long time since I've had peace and quiet. Special time with Jacob, without the kids, sounds like a good deal." So Rachel got the mandrakes and Leah got her peace and quiet with Jacob. So far, Leah has six sons and one daughter; Bilhah has two sons; and Zilpah has two sons. So the score is now Leah eight, Rachel two. Although Rachel had two children that she adopted as her own, it still wasn't quite the same to her as having her very own babies. "Please God," she prayed. "Please give me a son. I am happy with Jacob, and we have everything we need, and I thank you for that, but I really, really want children of my own. Please, please give me a son." God saw Rachel's heartache. He heard and answered her prayer and blessed her with an adorable, little baby boy of her own. "God has taken away my sadness," she said. She loved her tiny baby boy ever so much and cuddled him closely. She played with his little fingers and toes and marveled at the perfect little miracle resting in her arms. She called his name Joseph. But even then, she still wasn't happy. "God will give me another son," she stated emphatically. Rachel was right. Several years later, suffering much pain and hardship, she did have another son, and his name was Benjamin. The saddest thing though was that Rachel died shortly after he was born, so she never got to cuddle him or raise him. Instead, Rachel's maid, Bilhah took very good care of Benjamin. The baby competition was finally over. In the end the final score was: Leah six, Bilhah two, Zilpah two, and Rachel two, making a grand total of twelve sons for Jacob. He was a good father and cared for all his children, but Joseph and Benjamin were his favorites because they were the sons of his beloved wife, Rachel. What was the name of the only baby girl mentioned in the story? How many sons did Jacob have all together? Is it a good thing to have more than one wife? "Children are an heritage of the Lord" (Psalm 127:3). help us. In Jesus' Name. Amen. Last updated September 8, 2018.